From the Chase Poster Collection, SSHSA Archives. Photo from the Braun Brothers Collection, SSHSA Archives. TECHNOLOGY – At 990 feet long – about the size of five city blocks, the SS United States is over 100 feet longer than the Titantic. The SS United States’ designer, William Francis Gibbs, used no wood in the ship to ensure it being fireproof. The only exception: the ship’s grand pianos were made from a rare fire-resistant mahogany. They doused the Steinway piano in gasoline and tried to set it on fire, but it didn’t burn. The ship used more aluminum than for any previous construction project in history. It reduced her weight and made her the fastest ocean liner of all time. During her speed trials, she moved at an astonishing 38.32 knots or 44 miles per hour. 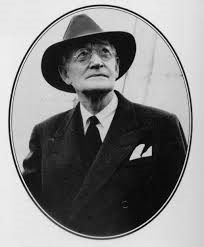 William Francis Gibbs designed the SS United States. Photo from Wikimedia Commons. Because of her light weight and powerful engines, the SS United States could go almost as fast in reverse as earlier liners (like the Titanic) could go forward. On her maiden voyage, she shattered the trans-Atlantic speed record in both directions. The first American ship in 100 years to capture the coveted Blue Riband (awarded to the fastest trans-Atlantic ocean liner), she still holds the record more than 60 years later. The innovative design of the SS United States was kept top-secret, constructing the ship almost entirely in drydock. Gibbs designed the ship as a luxury liner that could convert into troop transport in the event of war. The SS United States could carry 15,000 troops 10,000 miles without refueling. 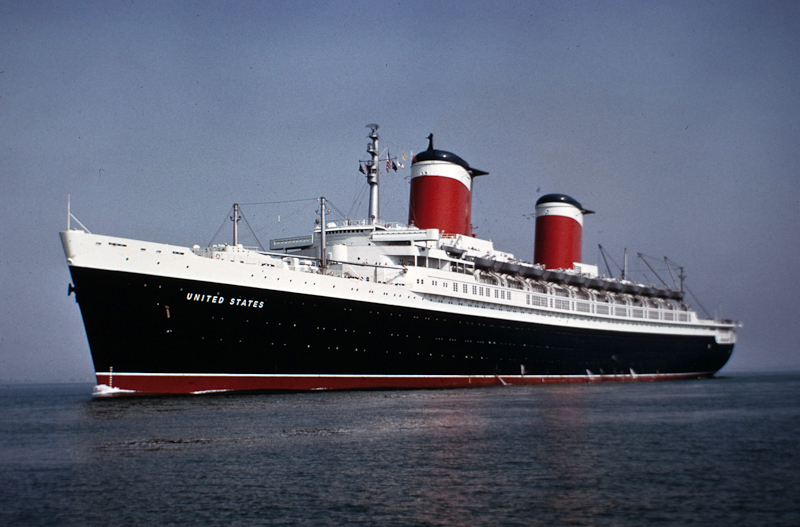 In 1969, the SS United States retired from active service. Fast and affordable trans-Atlantic airline flights took the place of ocean liners. Since 1996, the SS United States has been docked on the Delaware River in Philadelphia. Despite her faded appearance, the SS United States remains structurally sound to this day – a testament to her technological advancements in building. Watercolor painting, “S.S. UNITED STATES at sea” by Don Stoltenberg, (c) 2001. The galleys aboard the SS United States could turn out up to 9,000 individual meals a day. For her maiden voyage, the SS United States stocked 7,935 quarts of ice cream and 500 pounds of caviar. Four U.S. presidents sailed aboard the SS United States: Harry Truman, Dwight Eisenhower, John Kennedy and Bill Clinton. Famous passengers included Marlon Brando, Coco Chanel, Sean Connery, Gary Cooper, Walter Cronkite, Salvador Dali, Walt Disney, Duke Ellington, Judy Garland, Cary Grant, Charlton Heston, Bob Hope, Marilyn Monroe, Prince Rainier and Grace Kelly, Elizabeth Taylor, John Wayne, and the Duke and Duchess of Windsor. The Mona Lisa, Leonardo da Vinci’s masterpiece traveled aboard the ship to the U.S. for special exhibitions in Washington and New York. Watercolor painting, “S.S. UNITED STATES” by Don Stoltenberg, (c) 2001. What was the technological advantage to using aluminum in the design of the SS United States? Why was the building of the ship kept secret? Learn about conservation efforts of the SS United States Conservancy. Read this article about the failed attempt to repurpose the ship as a modern cruise ship by Crystal Cruises. More on the efforts to restore the SS United States to sail once again.